Windows laptops don't come much better than the Dell XPS range. Make sure you're getting the best price with our guide. If you've already started your hunt for a new laptop then you'll have undoubtedly encountered the Dell XPS series. It frequently makes waves in 'best laptop' countdowns – including our list of best laptops for graphic design. So what's so good about them? 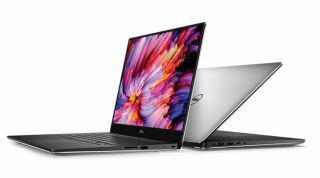 Whether you opt for the 13-inch or 15-inch version, Dell XPS laptops have a reputation for combining powerful specifications, dazzling displays and a beautiful build. If you want a reliable option and don't want an Apple MacBook, a Dell XPS makes a more than capable Windows-based option. They're certainly not a bargain basement option, but Dell XPS deals do tend to come in cheaper than the likes of the Microsoft Surface Book. And if you use our price comparison features below, you can be sure that you're getting the best XPS prices on the market. If you're in the market for some new creative kit, take a look at our roundup of the best Black Friday and Cyber Monday deals. The best Windows laptop money can buy in 2018. Quite simply, the Dell XPS 13 is among the world's very best laptops. It gets a massive tick in virtually every department, and the just-released 2018 version only improves the model still. In fact, the only real criticism we can come up with is the positioning of the webcam. So what's so good about the Dell XPS 13? Firstly, the almost bezel-free 'InfinityEdge' 13.3-inch display. Even if you don't pay extra for the unreal 4K Ultra HD option, the standard full HD default screen will lend your designs and drawings the clarity and colour they deserve. named Coffee Lake. Combine that with 16GB of RAM and a 1TB solid-state drive and you've got yourself a setup that's easily equipped to render images and videos with little delay. Weighing in at around 1.2kg, it's remarkably light and slim – so you'll be able to bag up for remote work, too. All the quality with a bigger screen. Everything that works so well in the supreme Dell XPS 13 is present here in the XPS 15 – just on a slightly larger scale. The broader InfinityEdge display is 15.6 inches of pure, unbridled Ultra HD joy. If video editing is your game then it should prove a trusted companion, with 4K 3840 x 2160 pixel precision and a touchscreen to bring cutting and editing control to your fingertips. Combine that with the Nvidia GeForce GTX 1050 card running off 4GB of video RAM, and you have the capabilities to beat what the latest MacBook is packing. It has a seventh generation Kaby Lake processor – it's not yet been upgraded to Intel's latest chip. But it doesn't lack for processing power, with the ability to boost up to 3.8GHz. You can pay less to downgrade the screen to Full HD and opt for a lower-grade i3 processor. But if you're spending this much on your new PC, it might be worth stretching the budget to get the extra quality. More of the same but with extra versatility. If you're willing to sacrifice a little bit of brawn, go for the flexible 2-in-1 alternative to the original Dell XPS 13. The name refers to the hybrid nature of the device – it's part svelte laptop, part chunky tablet. That versatility could come in handy if you often find yourself working in collaboration with others, and like to hand your work around the studio for everybody to see. Simply fold the 13.3-inch touchscreen back on itself around the 360-degree hinge, and enter Tablet mode. It also makes the device a lot easier for sketching directly on to, with Dell's Active Pen available to buy separately. Like the Dell XPS 15, the 13 2-in-1 is yet to get the Coffee Lake upgrade, and it does noticeably lack the power of its Dell contemporaries. But if you value the distinctive ergonomic functions above sheer speed, then the XPS 13 2-in-1 might be the best choice for you.